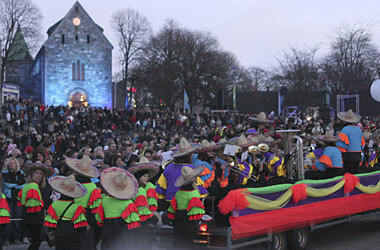 The King and Queen of Norway joined around 60,000 others in central Stavanger on Saturday 12th January 2008 for the opening ceremonies, including parades, french players on spring-loaded stilts accompanied by their 10 metre long insect (and band), fire,opera and motor boats on Breivatnet, aerial cycling acrobats, and more, with a massive firework display to follow. Stavanger has never seen anything like it. Coming up in March is Mot Himlaleite - a singing, dancing, musical show in the snow with ski acrobatics in Sauda. We will be steadily adding more information in the coming weeks - see our main event guide to Stavanger 2008. The opening ceremony in Sandnes on Friday 11th was also the moment when the first parts of the "Watercolours" light project in and around Sandnes were switched on. The picture shows people having fun on "Ønskebrønne", or "Wishing Well" close to the train and bus terminals in central Sandnes, just a few kilometers south of Stavanger. 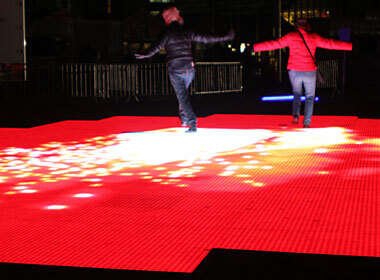 With a few people on, it will respond to their movements, with music and light. Run, and sparks fly off you! Kids (and everyone) will love this. Well done!